The competition is fierce, but perhaps the most consistent area of outright and arguably deliberate U.S. and worldwide press distortion is found in their coverage of the Catholic Church and its pontiff. Last week, the major international wires and several U.S. outlets once again demonstrated that readers, listeners and viewers can never trust that they will get an accurate story relating to these matters without also consulting other publications and online outlets. Numerous stories claimed that Pope Francis called Palestinian Authority leader Mahmoud Abbas (aka Abu Mazen) an "angel of peace." As Stephen Kruiser at PJ Media and Ellen Carmichael at National Review have noted, he did no such thing. This morning Pope Francis received the Palestinian President Mahmoud Abbas (Abu Mazen), in an audience in the Vatican Apostolic Palace.The meeting took place ahead of tomorrow’s canonization ceremony for the first two modern-day Palestinian saints and aftter a bilateral agreement was reached last Wednesday between the Holy See and the “State of Palestine”, to sign an accord int he near future which will regulate the status of the Church in the Middle Eastern country. As is tradition with heads of State or of government, Francis presented presented a gift to the Palestinian leader, commenting: “May the angel of peace destroy the evil spirit of war. I thought of you: may you be an angel of peace.” Pope Francis had called Abu Mazen a “man of peace” when he visited Bethlehem in May 2014, just as he called the then Israeli Prime Minister, Shimon Peres, a “man of peace” during his subsequent visit to Jerusalem. Let's say that an adult walked up to a high school basketball player, told him that he's very talented, and delivered the following wish: "May you become the greatest basketball player who ever lived." News organizations gleefully printed this claim across newspapers and news sites around the globe. 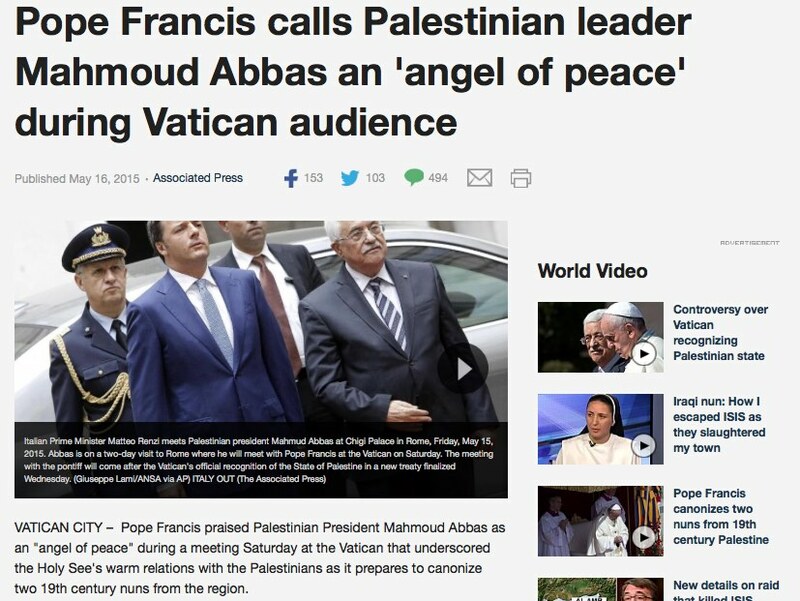 Agence France-Presse’s headline: “Pope meets ‘angel of peace’ Abbas after treaty announcement.” BBC: “Pope Francis calls Palestinians’ Abbas ‘angel of peace.’” The New York Times: “In Vatican, Abbas Is Praised as ‘Angel of Peace.'" As seen here and here, the Associated Press also headlined and reported that "Pope Francis praised Palestinian President Mahmoud Abbas as an 'angel of peace.'" There is no evidence of a correction at AP indicating that Francis did not say that. While there is room for discussion on the advisability of the pontiff and the Vatican beginning to treat "Palestine" as a "state," there's no room for completely mischaracterizing what he has said. It's very difficult to believe that the press's distortion here was not deliberate. What National Review's Carmichael characterized as "the eagerness of some in the media to paint His Holiness as some valiant advocate for the progressive cause" is simply too obvious.